there is something for everyone and every taste. 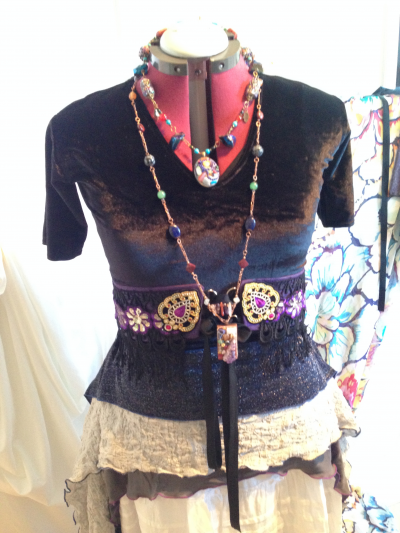 Suniitopaz is run by local bellydance, textile and craft enthusiast, Peta Fowler. Peta took her first Bellydance class in 1998, and has been involved with costuming ever since. Entering tribal and tribal fusion dancing around 2004, her sewing room hasn’t looked the same since. With a love of the textiles and colours used in these costumes, Peta creates a rich range of costumes and accessories perfect for shimmying. Peta began pattern making soon after 2004 as she couldn’t understand why so many dancers’ belts didn’t seem it melt into their hips. With this background, Suniitopaz is now known for very well made, uniquely designed hip belts that actually fit. In fact, Peta won’t let you buy yours, unless she has fitted it on you, to make sure it is the right size and shape for your body. Suniitopaz Creations’ hip belts are so pretty and so unique, and could be worn in non-dancing environments. I think they’d be perfect over a simple black dress or even to mix things up over your fav pair of jeans. Peta also creates many more simple, but effective street to stage (or other way around) wear. “Hand made (by me!) treasures: hip belts, pantaloons, accent skirts and hip drapes, very versatile drapes, decorative headbands, beads, jewellery featuring natural gems and stones. Also, Peruvian stone rings, and jewellery sets, Afghani necklaces, bindis. In a few words, Suniitopaz is bright, bold, colourful and fun!